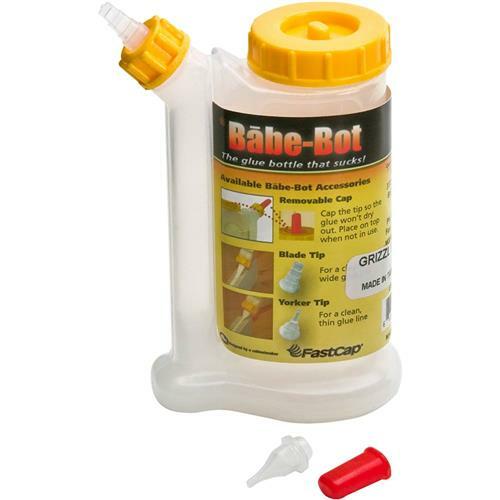 FastCap GB.BABEBOT - Babe-Bot, 4 oz. The same as the GlüBot, but in a smaller size! The GlüBot from FastCap is the only glue bottle that will not drip or spill, and the easy-squeeze will put the glue where you want it, and only where you want it. The GlüBot is designed with a 2-chamber system that pushes glue from the bottom up through the secondary side chamber with ensures fresh glue every time. Also features a wide mouth for easy filling, a wider base for better stability, and includes 1 Blade tip, 1 Yorker tip, and 1 red cap. 4 oz. size.